As winter snows start to melt and bare branches burst forth with buds, this gourmet vanilla cupcakes recipe topped with a lavish swirl of whipped honey buttercream frosting is just the ticket for a celebration of spring and the hope of sunshine and warm weather. It’s a lovely treat to banish away the last vestiges of winter blues. It’s especially nice when paired with a creamy vanilla English Breakfast tea like our House Blend. You can find a sunny nook and sip and nibble your way to relaxing bliss. 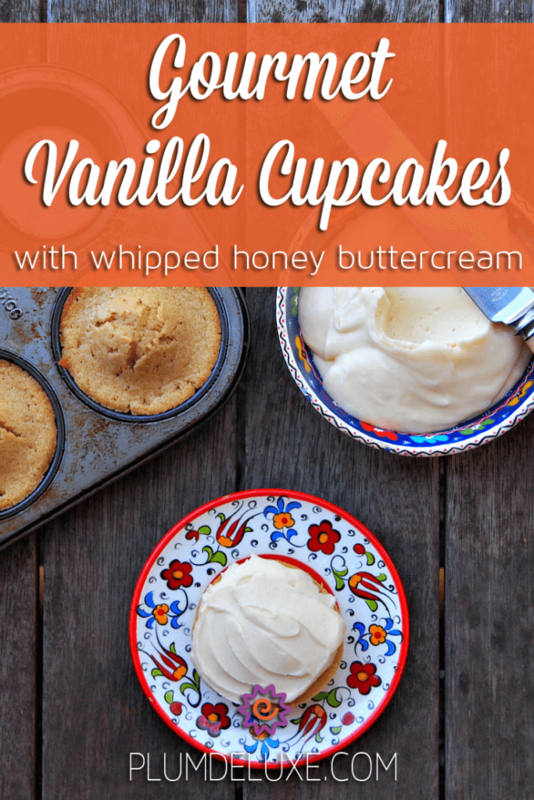 Vanilla cupcakes are traditionally made with white sugar and vegetable oil, but in this gourmet vanilla cupcakes recipe we amp up the richness with brown sugar, butter, and thick sour cream. I also like to add three large eggs to ensure the cupcakes are rich, moist, and tender, and I triple the vanilla extract to give them a deliciously warming flavor and intoxicating fragrance that fills the whole house while they’re baking. These cupcakes are not overly sweet since I like to ice them later. This makes them ideal as tea party cupcakes since they can take all sorts of sweet toppings without giving you or your guests a sugar rush. You can top these cupcakes with everything from simple buttercream frosting and brightly colored sprinkles to the decadent coconut topping used in German chocolate cake. These cupcakes also make a beautiful miniature version of our vanilla cake with hazelnut crumble. 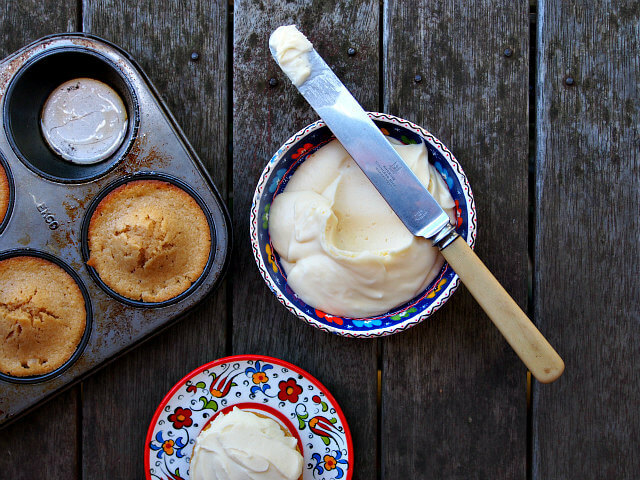 The toasted hazelnuts are absolutely marvelous with these fragrant vanilla cupcakes. If you aren’t a hazelnut fan, the crumble works equally well with chopped almonds, walnuts, macadamia nuts, or pecans. If you don’t fancy a topping, these cupcakes are good all by themselves. You can eat them warm just out of the oven, cold after storing in the fridge, or, if any last until the following day, halved, toasted, and smeared with salted butter for a simple morning tea. 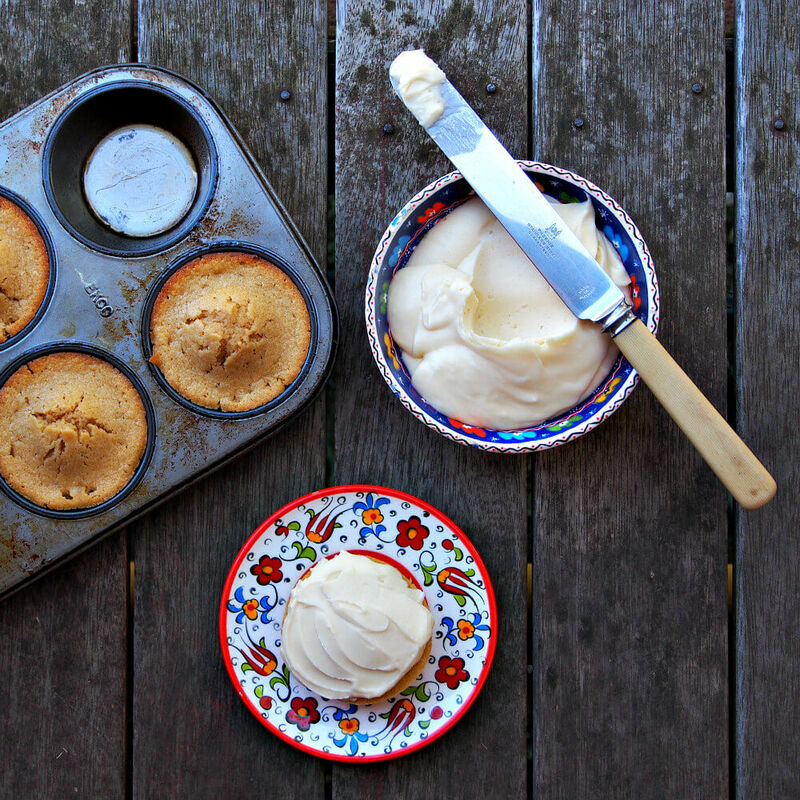 My current favorite choice of topping is a luscious whipped honey buttercream frosting. I’m a big fan of honey. I love it in tea and on my toast, smeared on a bran muffin and drizzled over cornbread. It is a gorgeous addition to this frosting. Buttercream frosting is usually made with butter, milk, and powdered sugar, but with the addition of honey, it can get too sweet very quickly. So instead of milk, I thin the frosting with sour cream. This, combined with the butter, makes a silky smooth frosting that celebrates the unique flavor of honey with a pleasant sweetness. This gorgeous whipped honey buttercream frosting can melt easily in high temperatures, so it’s an excellent choice for spring celebrations when cool breezes make sure it holds its shape. Keep it chilled in the fridge until you’re ready to frost your cupcakes, and it will spread beautifully and evenly with a knife or piping bag. That lovely smoothness that melts in your mouth is wonderful for your gourmet vanilla cupcakes. In large mixing bowl, beat together brown sugar and butter about 3-4 minutes until creamy. Add sour cream, vanilla, milk, and eggs, whisking thoroughly until smooth and creamy. In small bowl, stir together flour, baking powder, and salt, then add to butter mixture and stir until incorporated. Fill greased or paper-lined muffin tins 2/3 full with batter, and bake 15-20 minutes until lightly brown. Remove from oven and cool. When cool, ice with Whipped Honey Buttercream Frosting (see below). In medium bowl, whip butter until light and creamy. Add confectioner’s sugar, and beat carefully until smooth. Add honey and sour cream and beat until smooth. Chill until ready to frost cupcakes (see above).